Russian art week was a success after a buying spree that broke several previous records with pounds 50m changing hands, the highest auction turnover since before the credit crunch recession. Dealers also reported good trade behind the scenes. The bi-annual event saw Mayfair overflowing with Russians as they flew in from the four corners of the world to participate in the exhibitions, lectures and auctions. The auction houses threw cocktail parties where oligarchs and their tall beautiful bored-looking girlfriends mixed with dealers, consultants and auction room personnel. The Polo Bar at the Westbury Hotel reputedly ran out Whiskey at one point and Novikov was booked out for the week. The top lots attracted frenzied bidding whilst at least half the lesser lots, which were mainly of a poor quality, failed to sell at Sotheby’s, MacDougalls and Bonhams. Christie’s fared better selling 3/4 of their lots. The reported auction turnover was Sotheby’s(pounds 13.98m), MacDougalls(pounds 9.4m), Christie’s (pounds 12.4m) and Bonham’s(pounds12.384m). The most expensive Russian painting in history was sold at an auction at Bonham’s for £7.9m. 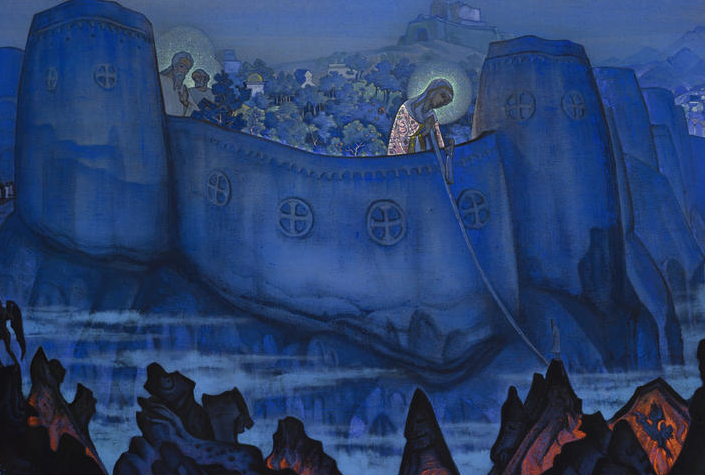 The purchase of Madonna Laboris, painted in 1931 by the artist and philosopher Nikolai Roerich, by an unnamed telephone bidder was the highlight of the sale. Madonna Laboris is part of a series of works depicting the Great Female Deities of the World, one of Roerich’s spiritual obsessions. It was believed lost, until it re-emerged in a private collection in the US. Prior to the auction, Yelena Harbick, director of Russian Art at Bonham’s in New York, described the painting as, “a major rediscovery of a masterpiece of great significance” and predicted correctly that there would be “considerable interest among international collectors”. The painting depicts the Virgin Mary inside the blue, glowing walls of heaven, letting down her scarf to help souls climb in. Harbick lauded its, “balanced and harmonious composition, rich and saturated tones of turquoise, cerulean blues, sea-foam greens with black and fiery-red accents”. Theodora Clarke, editor of Russian Art and Culture, who put togather a useful guide to the week’s activities, noted the increase: “It is incredible to think that just over ten years ago, Sotheby’s Russian painting sales only made around £4m a year.” Theodora Clarke also chaired the discussion over, ‘The Russian Art Market:Fakes and Forgeries’ held at the Erarta Gallery at the beginning of the week. The speakers were Alice Bradley of the Art Loss Register, Dr Jileen Nadolny of the Art Access and Research Project and the dealer James Butterwick who stole the show with his expose of two recent books on Goncharova which are full of fakes. His advice was :- if a Russian painting is signed, has no provenance, literature or exhibition history, is accompanied by certificates and technical analysis, and is being offered for a fraction of its real value…..its almost certainly a fake. Quite so. The rise in the market for Russian art reflects both aesthetic and financial trends. “Art is being seen by high-net-worth individuals as a good alternative investment, given the eurozone crisis,” says Clarke. “As a result, buyers want top-quality works with a good provenance, which is what the main auction houses offer.” Nineteenth-century paintings have always been popular, but recently modern and contemporary Russian art has also been enjoying a boom. Still Life with Fruit, by avant-garde artist Ilya Mashkov, sold at Christie’s for £4.7m, more than doubling the record for this artist — Still Life with Flowers (1909), which sold for £2.4m at Sotheby’s in 2005. The vibrant Still Life with Fruit, which shows the influence of Russian folk traditions as well as Matisse and Cezanne, was first exhibited in 1910 at the inaugural show of radical art group the Jack of Diamonds. Christie’s experts described it as, “the most significant example of Russian neo-primitivism to have appeared at auction in recent years”. Avant-garde art has smashed records before at Christie’s. In 2008, and then again in 2010, Natalia Goncharova became the most expensive female artist ever at auction when her bold and original still lives went for more than £7m. Goncharova was in demand again on Monday evening when her striking Femme Cubiste (c.1920) netted £662,500 at Sotheby’s. Another work from the same period, Yuri Annenkov’s haunting portrait of the poet Anna Akhmatova, went for five times the lower estimate, almost reaching the million-pound mark. This had sold for pounds 100,150 in 2002. Even artists with a low profile in western Europe can do well. Alexander Volkov’s Child Musicians (1926) sold at Bonham’s for more than £2m, including the buyer’s premium — ten times the lower estimate. Child Musicians is a joyfully enigmatic painting in which tambourine-playing children seem to be about to escape from their cramped frame. Bonham’s Sophie Law described Volkov’s work as a fusion of “western modernism and Central Asian art and life”, and praised him as “an incredibly interesting artist” and “the father of the Oriental avant-garde”. With the exception of a brief slump during the 2008 crisis, Russian art has been fetching high prices in London for more than a decade, and this is likely to continue with the Russian economy growing on the back of its huge reserves of resources inlcuding diamonds, oil, gas, timber, gold and grain. Only a major political crisis, which seems unlikely at present, or another world slump is likely to derail this runaway train.